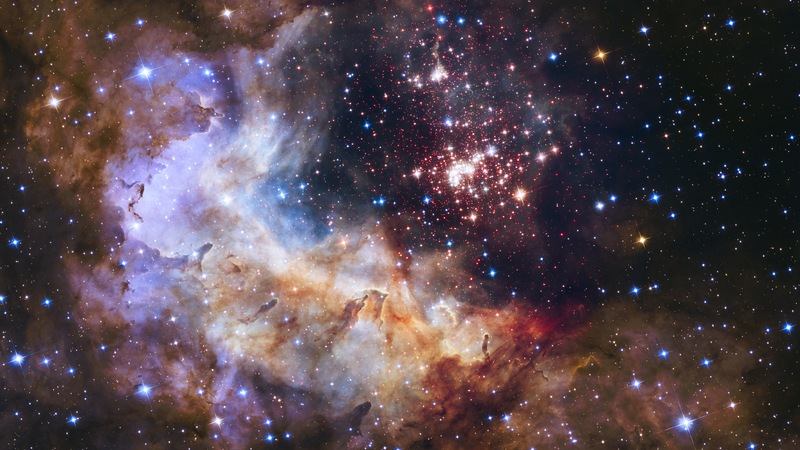 NASA and ESA are celebrating the Hubble Space Telescope’s silver anniversary of 25 years in space by unveiling some of nature’s own fireworks – a giant cluster of about 3,000 stars called Westerlund 2. The cluster resides inside a vibrant stellar breeding ground known as Gum 29, located 20,000 light-years away in the constellation Carina. The comparatively young, 2-million-year-old star cluster contains some of our galaxy’s hottest, brightest, and most massive stars. The largest stars are unleashing a torrent of ultraviolet light and hurricane-force winds that etch away the enveloping hydrogen gas cloud. This creates a fantasy celestial landscape of pillars, ridges, and valleys.